I find myself thinking about saving money in my daily activities pretty frequently. Three examples that come to mind: I can get annoyed that a light is left on in a temporarily unoccupied room. I am worried that the refrigerator door isn't closed quickly less some extra heat get in there. I am careful with the amount of detergent used for a load of laundry so that I don't use 'too much'. If I add up all this stuff it really doesn't amount to all that much money. Leaving a light on all day will only add up to $5-10 dollars a year. A 10% increase in electricity use for our refrigerator would add $5-$10 to our electricity bill. A 20% increase in our laundry detergent is probably $10 a year. So I add these 3 items up and I'm talking about $30 a year in total cost or savings. Saving $30 a year is good. However the problem I have is that I spend an inordinate amount of time worried about these 3 items compared to the amount of money that I'm saving. This is of course not to say that I think everyone should leave all their lights on, open the fridge door and use triple doses of detergent. Being wasteful is not financially smart. But its also not smart to worry about small things like this too much. I shouldn't sweat the small stuff so much. Our fourth rental was originally my wife's home when I met her. When we got married we decided to move into my home together and then rent out her home. Currently the house has about 50% equity in it. The house is worth about 50% more than what it was bought for about 7 years ago. It has appreciated around 5.5% since the initial purchase. We are netting a small cash flow of maybe a few hundred dollars a year. But that would easily be eaten up if we ran into any repair or maintenance bills. On the other hand we do get a decent tax deduction and the loan principal is being paid down faster now which puts us a bit ahead financially overall. Best case we're getting about 6% return on equity but the month to month cash flow is negligible. So far we're doing fine with this rental financially but it has not been a rental for very long. And we've had minimal repair and maintenance costs and no vacancy problems and its only a matter of time before those costs things hit us. The notable story on this rental was what happened with the preparations before we rented it. When we first decided to rent the house we had to clean out my wife's belongings and make some repairs. Cleaning out the house took a while. If you've ever had to clean out a house full of 'stuff' that has been accumulated over several years then you know how time consuming it can be. As we were moving in together we also had to sort out which of her belongings to keep and which of mine to keep. We couldn't fit all her stuff and all my stuff into our current home and we had duplicates of many things (two toasters, two beds, etc.) Once belongings were sorted out we had to haul them somewhere, usually to a charity or the trash. This whole process ended up taking 2-4 months. The cleaning and repair work we had to do wasn't very extensive but there were a few things to get done. We had to clean up the place, paint and then fix some damage to the kitchen floor and bathtub. We ended up doing all the work ourselves with the help of a couple relatives for the more complicated things. In addition to the main things we did there were a ton of little projects that added up to a substantial amount of work. I'm not sure how long we spent in the cleaning and repair stage but it was probably 1-3 months. Altogether it took us 5-6 months to get the house prepared to rent it. That is 3-5 months more than it should have taken us. Every extra month we took was a months lost rent so the wasted time lost us 3-5 months worth of rental income. Let me repeat that: we wasted 3-5 months total time while preparing this rental for market and lost 3-5 months rental income in the process. We wasted time in a number of ways. Part of it wasn't exactly our fault. My wife's house is on the other side of town and it can take 1-2 hours to get there depending on traffic. That makes it a bit harder to get more time there to do work. But most the time wasted was our fault. We decided to do all the work ourselves. That seemed like a good idea since paying people to do repairs is expensive. But in hind sight if we'd paid professionals we'd have gotten things done much sooner and it would have saved us money in avoiding lost rent. We also got help from our relatives which meant doing things on their schedule. We weren't very efficient with our time usage and often spent just 2-3 hours at a time working which is an easy way to turn a few days work into a month. One of the biggest reasons we spent so long was that we didn't feel a sense of urgency. In several cases we underestimated how much work we had to do and how long it would take to do the work. We also spent a lot of time planning and deciding what to do rather than doing it. Lack of an initial overall plan wasted us a lot of time. We started out without really thinking of everything that needed to be done and so we didn't have a real overall plan to get all the work finished. To be fair to ourselves we didn't plan to waste 3-5 months. This is another situation where hindsight is 20/20. We had some good intentions in doing work by ourselves to save money and we didn't initially realize just how fast time was going by and how slow our work was progressing. At the time it didn't seem like a bad thing that we were only spending half of most weekends and additional weekday hours working on our property ourselves. Seeking the skilled help of relatives also seemed like a good idea at the time but then trying to work it all into coordinating your free schedule with their free schedule and you can turn around and a month has gone by. Maybe we should have known better in the first place, but if we didn't know better then we do know better now. Next time we'll know to treat the work with a sense of urgency up front. Every wasted day is wasted rental income. In hind sight I'd try and get the work done as fast as possible and hire professionals to do it. The amount of work we had to do could have been accomplished within a month without that much difficulty. I would have done preparation for moving first which would be the biggest time sink then I'd simply hired professionals to do everything else. Hiring people certainly would cost us more than doing it ourselves but it would have saved us money. For example : Paying someone to fix the floor in the kitchen probably would have cost us $500 but wasting a month to do so lost us more rent. I wouldn't always hire professionals for everything. I would have done the painting myself. It only took us a part of a weekend to paint the house and we probably saved $1000 or more so doing that ourselves still makes sense. I'll also make sure that I have a strong plan with a good assessment of all the work that needs to be done. And I will make sure I don't underestimate the amount of work required. Overall this rental has been a good investment and it has worked out fine. The key learning from this rental was that we should not waste time doing work and renting a unit faster will pay off in higher rents. Before we were married my wife lived on the East coast for a few years during college and afterwards. Eventually she decided to move here to the West coast. She owned a house on the East coast at the time and decided to keep it as a rental after moving here. My wife bought her East coast home about 7 years ago. She bought it a few years before the real estate bubble burst. I'm going to take the more conservative view that the house is at the lower end of its value range on Zillow which would mean the value is about equal to the mortgage balance so we've got 0% equity right now. It could be worth a bit more than that if you take Zillows high end so best case we might have 10-20% equity. The house has not appreciated much if at all. We are currently renting the property for a little less than the mortgage payments. We also pay a property manager 7% of the rent to manage it. We're losing money every month which is not a good thing. The negative cash flow isn't substantial but any negative amount isn't good. If you add in the tax deduction impact and the principal payments on the loan we're actually coming out a little ahead. But I generally wouldn't recommend buying a rental that has a negative cash flow. Note this story started before I met my wife and then continued through when we were engaged and proceeds now after we've been married. I'm not sure of the exact chronology about what things happened before or after we met or were married. So my references to my wife or we are mixed up here its cause I don't know which points I was more or less involved. Sorry if its confusing. When people think of buying rental property they often decide that hiring a property manager is the easy way to avoid doing much work. That is a good idea in general as long as the costs work out, but you are very dependent on the property managers abilities and trustworthiness to make your rental a success. Unfortunately one property manager my wife eventually ended up with was not trustworthy at all. When my wife originally decided to rent the home she did the research and found a good property manager and signed her up. Everything worked great with that first property manager until she abruptly decided to leave the business. My wife was then left scrambling to find another property manager form the other side of the country. My wife hired another property manager that the first property manager referred her to. It turns out the second manager was just someone the first manager "heard of" not a trusted peer. That very important detail wasn't clear at the time. The second manager was OK but she generally didn't answer the phone but instead called back after you left a message (red flag). Things were fine for a while until the tenants moved out. That is when the second manager started to show how bad they were. She failed to get work done when she said she would (red flag). It took two or three months to get the home cleaned up and it sat vacant that whole time. (red flag) Thats one or two months longer than it should take and thats lost rental income out of our pocket. Furthermore they did not give us real receipts or invoices direct from contractors for work they said was done but instead only gave an invoices they created (red flag) so in hindsight we don't even know if the work was really done or if they just pocketed the money. That may sound cynical but just keep reading. After 2-3 months of inaction and run around by the manager my wife gave up and decided she couldn't keep paying a mortgage without rent coming in. So she called some realtors and decided to just sell the property. As soon as the manager found out my wife wanted to sell the home they ran out and found a tenant. Its remarkable that they couldn't find someone for 2-3 months then magically rented it in a day or two. (red flag) Now that the property was rented the pressure was off and the rent coming in would pay the mortgage (mostly). At this point it seemed as far as we really knew the manager had not done anything worse than been too slow to find a tenant. That isn't necessarily something you fire someone for on the first offense and its hard to say if that kind of thing is the managers fault entirely or not. My wife decided to hang on to the property at this point. There wasn't a clearcut case for firing the manager plus selling the home from 3000 miles away would have been pretty difficult to manage. Less than a year went by and the property manager failed to get us the rent payment a couple weeks into the month. The manager claimed to be having some personal financial problems (giant red blinking neon flag) but they said they would fix it soon. I think this is the point that the red flags added up and it really sunk in that the property manager was not capable or trustworthy. So my wife waited and called and called. They didn't answer the phone nor return calls much and when she did get ahold of the manager she gave assurance they'd send the money soon. The old "check is in the mail" routine. Then next month came around and we were now owed two months rent by the manager. My wife found out the renters had in fact paid the manager the rent but the manager then apparently spent it or simply pocketed it. The manager stopped returning calls. So at this point we hired a new manager to immediately take control of the property. In hind sight we should have fired the bad manager much earlier but the extent of the problems weren't clear. The problems created by the bad manager didn't end after we fired her. The tenant they rented the house to was not a great tenant. They mostly paid their rent on time but they did a fair amount of damage and we didn't have a copy of a lease or a security deposit. When that tenant left about a year later there was significant damage and repairs needed that ended up costing us several thousands. Its not clear when the damage was done. It might have been problems that occurred during previous tenants under the bad managers management. But either way the bad manager either rented the unit to tenants who did a lot of damage or failed to properly repair earlier damages. Our current manager has done a great job and we're very happy with her. The property has actually had three managers now and two of them have done a great job. I would assume that the majority of property managers will do a decent job and that the chances of having a property manager basically steal money from you is not likely. But it only takes 1 bad apple to ruin it for you. I noted a lot of red flags above. At the time some of these weren't obvious or they gave us excuses that we bought. Maybe we should have acted much sooner to fire that manager but its hard to know when someone is just a little slow or makes an excusable mistake. It can take a little while for all the red flags to add up. We hadn't dealt with a bad property manager before. If we encounter problems with a manager again then we'll be better able to spot the red flags as they happen instead of recognizing them in hindsight. My wife investigated taking some sort of legal action against the property manager but given the amount of money owed it wasn't practical. Generally the main option in this situation would be small claims court and you have to do that locally which would mean flying across the country. We figured we'd win the case but thats no guarantee we'd get any money, as far as we know the manager is bankrupt or has since moved out of state. Local law enforcement in that area were no help. If this rental was local then we wouldn't have needed a property manager at all. Or if we did hire a property manager for a local rental then we'd have a much easier time keeping an eye on things. Worst case if a local property manager ripped us off then we'd have a much easier time taking legal action locally via small claims court or local legal system. I wouldn't recommend doing an out of state rental investment unless you have a very trustworthy person to manage it for you. This is not to say an out of state rental can't be a success but the horror story above can and does happen so make sure you trust your property manager. You should be careful when hiring a property manager. This person is going to be your employee in a way. You'll be trusting them with your money and giving them power to get work done. Get references and check up on them. Interview them like you're hiring an employee. When you have hired a manager make sure you get before and after pictures as well as receipts for everything. Since the rental has a negative cash flow and the problems we have had it would seem like we should sell it. We've thought about selling the house more than once. But after the real estate bust selling a property wasn't exactly easy. If we sold it now we'd have to pay a realtor commission and end up losing several thousand dollars out of pocket in the deal just to offload the property. Our expectation (hope) has been that the property would go up in value within a few years so if we could hang on to it for a while it would be in a better position to sell it. However we didn't expect to have to pump several thousand dollars into repairs the past year either. It may very well be a mistake for us to hold on to the property, but hopefully the market will turn around and we can recover our costs. Honestly I am torn about this and I don't know if we should cut our losses now and sell it at a lost or if we should hang on a few years and wait for it to recover value. I bought my second rental about 3 and a half years ago. I again bought the property 50% / 50% with my father. This time my father was the one that found the property. In fact he had a Realtor he knew that bought the property to his attention. The property was a 5 plex on the market for roughly 80% of market value. The owners had bought it less than a year before that and they had paid about $10k less than they were selling it for though I didn't know their purchase price at the time. When the previous owners bought it they started to convert 3 of the units into a single family home for themselves. But they didn't really seem to know what they were doing and accomplished little more than tearing down a couple walls. They rented one unit to a friend of theirs. So the property had only one tenant and a some walls half torn down. Overall the property was in decent shape but it needed some repairs and renovation. Nothing really major but some of work that needed to be done. We acted quickly and offered them $5,000 less for the property and they accepted it. Within just a day or two after we made our offer 2-3 other offers came in at full price or $5,000 higher. We were lucky to have made the offer as fast as we did or we wouldn't have gotten the property. My dad did a bit of work to fix it up and restore the walls that they previous owners had torn down. Other than returning the 3-plex to 3 separate units by restoring a couple walls the buildings did not require any major work. Most of the required work was cosmetic, surface level changes like paint and new fixtures and such. The property is now worth 20-60% more than we paid for it according to Zillow. As a 5 plex we could easily sell it for a 30% profit over our purchase price. That gives an annual appreciation rate of about 7.5-8%. With rents netting a return on capital in the 5% to 6.9% range. This is another success story in rental purchase but its possible we could have had a failure here as well. If we'd bought the property with a hefty mortgage and then had difficulty renting the apartments then we could have had negative cash flow. If we had bought the property with little or no experience as landlords then we might have selected tenants poorly and ended up with deadbeats, lots of property damage and no rent. If we had some bad luck the property might have had major repair requirements that could have cost us substantial amounts of money. Theres always a little good or bad luck involved in a property. In our case we profited from this deal because we were able to act quickly and make an offer that was accepted. If we had waited just a day or two more than competing offers would have won the property. I'm not saying you should rush into buying property or make hasty decisions. But if you have your financing and other ducks in a row then quick action can benefit you. I have funded my Roth IRA for 2010 so I now have more money to invest. Now I have to decide what to invest the funds in. My main desires for investments are those with a decent yield but still have solid financial and some growth potential. A while back I talked about stocks & ETFs that I had on my watch list. I'll start with those. 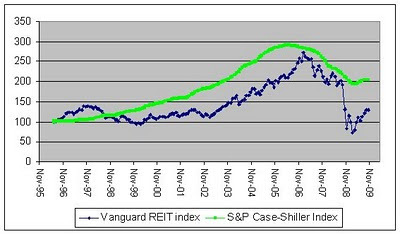 Vanguard REIT ETF (VNQ) - Yield 5.1%. Expense ratio 0.11%. This is a Vanguard ETF that invests in an index of REITs. I like REITs in general and this is a good way to be in REITs in a diversified way. However the yield isn't as good as I can find with individual REITs. ishares high yield bond ETF (HYG) - Yield 7.8% Expense ratio 0.5%, This ETF invests in junk bonds. The yield is very good but theres risk that interest rates will go up and the price of the fund would drop. Theres no potential for growth in bonds like I could get from company stocks. SPDR S&P dividend ETF (SDY) - Yield 3.72%, Expense ratio 0.35 This ETF invests in the stocks that comprise the S&P 500 Dividend Aristocrats. The Dividend Aristocrats are the stocks in the S&P 500 that have raised their dividends every year for 25 years in a row or more. The appeal for this fund is that its nicely diversified across companies with a proven track record and it pays a decent yield. B P PRUDHOE BAY UTS (BPT) - Yield 8.0% This is an oil trust. So while its not an ETF I threw it in this pile since its not a standard company stock. I talked about Investing in Oil Royalty Trusts before and BPT seemed to be one of the better bests in this field. Dupont seems to be faltering on their earnings. Pfizer has already had a pretty good run up in its price and its yield is only 3.7%. BP's payout and PE are relatively high. Verizon's numbers look OK with a 5.9% yield and PE of 16. Plus Verizon's stock is down about 33% from its high from a couple years ago. Overall Pfizer and Verizon look best among these. I ran a filter in Yahoo and looked for companies with market cap >= $5B, PE of 15 or less and yields of 4% or more. A number of the results were energy utilities so I figured I'd take a look at some of those. 2008 Annual Report Cut their dividend in early 2009 by 39%. Has Baa3, BBB- and BBB+ rating with Moodys, S&P and Fitch respectively which is barely investment grade. The yields on these energy companies seem pretty healthy and the risks don't seem very high for a utility. Ameren seemed like a decent buy in this group. But I don't see much room for growth in these companies in general. But right now I've already got over 1/3 of my existing Roth IRA assets in REITs so I'm not really wanting more exposure to that sector. I've decided against buying more REITs for now. Right now I'm still doing research so I'm not going to buy anything immediately. I want to continue to dig into the details and see what other stocks or funds I might want to buy. From my research so far I'm leaning towards: BPT, VZ, PFE, SDY, and HYG. I may or may not buy some or all of those. A few months ago my sister bought a Kodak printer in order to save money on their printing costs. She had seen advertisements from Kodak advertising their cheap printer ink. Kodak ink is $10 for black cartridge and $15 for a color cartridge . That is much cheaper than the ink cartridges for other printers. Our HP printer cartridges seem to cost about twice as much. The Kodak printers seem to start over $100. The cheapest I could find on Newegg was $120 and cheapest on Amazon was $100 . HP printers can be found for under $50. So you've got about $50 higher up front cost to go with the Kodak printer. Kodak's own analysis claims annual savings of about $120 over the average printer. The HP models seem to be less than average and about $70 more than Kodak. So it would seem to take less than a year to recoup the higher cost of the Kodak printer. However the catch is that Kodak's analysis assumes average printing of 150 photos, 800 pages B&W text and 500 pages mixed text and graphics. That seems like a LOT of printing. I don't know if that is really a typical amount for a household or not. It is definitely much more than my wife and I print. I'd say that their average usage is around three times as much as we print. If we print a third as much as they assume then we're only saving about $70 / 3 = $23.33 a year in ink using the Kodak compared to an HP. At that rate it would take over two years for us to recoup the higher cost of the Kodak printer. If you print very little than the Kodak printer will take years to pay for itself. I bought my current HP printer because the quality on my previous Lexmark printer wasn't good enough. So if I'm going to buy another printer then I would want to make certain that the quality is as good as my HP which I know has good print quality. This article from the Boston Globe concludes that the Kodak is cheaper but the quality is lower. But this article from Yahoo had a more positive view of the Kodak printers. Skimming the customer feedback on Amazon it seems that HP printers have generally higher reviews than the Kodak printers. I'd have to do a bit more research to get a clear picture of the quality difference but it seems HP has higher quality. I do think that Kodak printing is cheaper in the long run compared to most inkjets. However if you aren't printing a lot then the higher initial cost of a Kodak printer may not be worth it for the lower cost ink. Quality of the printouts may be a concern, if you're thinking of switching to Kodak printers then I'd compare the print quality first to make sure it meets your needs. So the real answer is : It depends. If you do a lot of B&W printing then also see my previous topic: Should you Buy a Laser Printer to Save Money? Slightly Used Space Shuttle 30% off! Now only $28.8M. If you've been looking to pick up your own used space vehicle now might be the time. NASA has put their used space shuttles on sale for 30% discount off the original asking price. They originally wanted $42M for them to buy a used shuttle after they were retired but now they have dropped it down to just $28.8M. I usually tip 20% on my bill when we eat out. I do this because thats the system we have. I tip lower if I get crappy service. Usually my low end tip for sub par service is 15% and maybe down to 10% if they are particularly bad. I feel I'm pretty generous with the tips. I can only remember one time that I left no tip and that situation was very warranted in my mind. Overall I don't really like the system of tipping that we have in the USA. I certainly don't have a problem with people making money. Its just that the system we have just seems arbitrary to me. If you work at McDonalds you get minimum wage and no tips. If you work at a buffet you might get sub minimum wage and minimal tips. If you work at any restaurant that serves food then you are expected to get sub minimum wage plus 15-20%. So 3 different people doing basically the same job get none, some or most of their wages via tips. I do think that people who work in restaurants should get a decent wage, but I just don't like the structure of the tipping system. I also don't like the fact that tipping is a % of the cost of the meal. If I order a $25 steak then I'm supposed to pay $5 for the waiter to write my order down and hand me the food. But if I buy a $5 burger then writing that down and bringing it to me is only worth $1. Doing the same amount of work gets different pay rates simply based on the nature of food I order. Of course the counter to this is that the service level and expectations at a fancy restaurant are higher so the compensation should be higher. Tipping rates have increased over time for some reason. This report on tipping has a bit about history of tip rates. They cite references from 1895, 1928 and 1937 that said that 10% was the established standard for tips at the time. Then they have a 1984 reference stating 15% tips were typical and by 1997 someone mentions the figure moving to 20%. This MSN article from 2008 states 20% is the new 15%. So in my lifetime tipping has gone up at least from 15% to 20% and I am pretty sure I remember the range being 10-15% when I was younger. I don't know when we went from 10% to 15% for the minimum and it might have actually been before my time. Why have tip % rates increased? You might argue its to keep up with inflation but the price of food has been going up so tips would go up too. Why did we as a society decide that we should pay waiters 100% more over the past 100 years? The system isn't even consistent from state to state due to differences in minimum wage laws. In 7 states wait staff gets the full minimum wage. My state is one where wait staff gets the full minimum wage which here is over $8. So its not like most states where servers earn $2.13 per hour plus tips. They get over $8 as the minimum and tips are all on top of that. My sister used to average $15 an hour in tips at a smallish family restaurant with average price food back about 20 years ago. I can only imagine what people pull in at more expensive restaurants here nowadays. Would service suffer if we had less dependence on tipping? One argument for tipping is that it gives the servers an incentive to work harder. 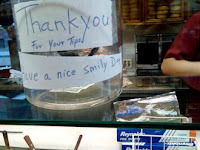 I'm not sure how well tipping works as a reward or incentive for good work. It seems that servers have the expectation that they'll get 15-20% in tips and if they don't then the customer must be a cheapskate. If we tip people 15-20% all the time then they aren't really seeing much feedback on their performance and the status quo is that they get 15-20% in tips. For tips to be a good incentive for performance we'd have to have better and clearer feedback. In Europe they do not have much tipping that I've seen and in my limited travels there I didn't see bad service from wait staff. I would much prefer if we had less dependence on tipping and just had higher base wages. Adorama has a Samsung Bluetooth headset for $1 after a mail in rebate. Their price is $24 and the mail in rebate is for $23. They also have free shipping. If you can move a significant chunk of your itemized deductions from one year to the next then it might save you on your taxes. Are you just short of having enough deductions to itemize but you're able to move your deductions from one year to the next? IF so then it might save you some taxes to move those deductions and consolidate your itemized deductions in one year. Everyone gets at least the standard deduction no matter what. So if you have deductions that could be itemized but which aren't enough to exceed thee standard deduction then carrying them forward another year might pay off. Simple example: If your only itemizable item is $5,000 of charity a year then thats not enough to exceed the standard deduction, but if you made donations of $10,000 in one year and nothing the next year then you can itemize and claim the full $10,000. Emily is a single person making $45,000 a year. She rents and does not have a mortgage deduction. Her state taxes run her about $2,700. Her only other itemized deduction is her charity contributions. She gives $2,500 a year to charities via cash contributions and donated items. Between her state income tax and charity deductions her itemized deductions come out to $5,200 a year. This is below the standard deduction ($5,450 for 2009) so it doesn't pay for Emily to itemize. However if Emily delayed her charity giving from one year and instead gave double the next year she could claim $5,000 in charity giving for that year. In other words instead of claiming $2500 in 2009 and $2500 in 2010 she could give $5000 in 2009 and $0 in 2010. For the one year with double charity giving combined with the state income tax she pays she would have $7,700 in itemized deductions for that year. Then for the year with no charity giving she could just claim the standard deduction. With a standard deduction her tax bill is $5,200 but with the $7,700 itemized deductions she'd drop her taxable income by $2,250 and cut her tax bill by $547 to $4,653. Even if you do have enough deductions to itemize then it can still make sense to move some itemized deductions from one year to another. Another example: A married couple who has $9,000 in deductions from mortgage interest, property tax, and state income tax plus $3,000 in charity donations a year. Normally they have $12,000 in deductions per year. If they make $6,000 in one year and $0 in the next year they'll have $15,000 in one year and claim the standard deduction of $10,900 the next year. Thats a $1,900 reduction in taxable income. If you have annual deductions that that you can't really move and are more than the standard deduction then you won't benefit by moving other deductions. Generally if your mortgage interest, state taxes and or property taxes add up to more than the standard deduction then you may as well itemize every year. This article is about pretend investing that I do in the online site Updown. I'm documenting my stock picking choices so that in the future I can look back and learn from my mistakes and successes. I've been sitting on a pile of cash in Updown from stuff I've sold. I've seen some of my REIT purchases go up quite a ways and I just sold off half my HPT to cash in profits. So I figured I should go looking for some new good REITs to buy. I ran a filter in the stock screener at Yahoo starting with just any REIT with a yield > 5%. From there I examined the financials of REITs with attractive yields to see if any were good value. I crossed off any REITs that seemed to be having troubles or otherwise on a downward path. If I was interested after checking out their basic stats and finances I then skimmed through the last annual report. After eliminating a few less attractive REITs I ended up with a couple REITs that I thought would be worth buying. Medical Properties Trust Inc. (MPW) - As their name implies Medical Properties Trust owns hospitals. Their financials are pretty solid. Right now the yield is 7.7%. They don't have significant debt due until 2011. Pros: Relatively safe sector. Con: Not much upside, high executive pay. 2008 Annual Report Current price: $10.28 Target $12. Note the current prices listed are from a few days ago since I'm writing this after I did the initial research. I bought both REITs in Updown then put in some sell limit orders to sell 50% of my stake if they hit my target prices. The federal government has about $300M in rebates for energy saving appliances. The money is being handled individually by each state. So the details of what rebate you can get and how it work will depend on which state you're in. You can visit this Energy Savers page to find out what rebates are available in your state. If you're looking to replace an older appliance or make energy saving improvements then check out the details for your state to see what you might qualify for. If you want to get an extra $25 for signing up with an ING Direct savings account then you can get referrals via the Bargaineering ING Direct referral page. If you're looking for a good online savings account then ING Direct is a good option. I've had an account with them a few years and I've never had a problem. Our electric bill for December came out at $241.99. Last year in December our bill was $313. If I assume that the non-heat related electricity is about $80 then that means we spent $233 on heat last year and $162 on heat this year. Thats a 30% savings on heat bill this December over least year. The month of December was a little bit colder in 2009 compared to 2008. In 2009 December had about 854 degree days here and in 2008 it was about 875. I am also working with the general assumption that our electricity usage has not varied significantly this year compared to last year. This winter has been a little colder than last year. We noticed recently that our cat was sick with something. She was sneezing a lot, her eye was a little runny and she was acting a little weird. My wife took her to the vet and they said she basically had some sort of flu virus. It doesn't seem serious and the cat should be OK thankfully. The vet gave the cat some antibiotics and fluids and also gave us a couple different medicines to give her. Overall the bill ended up about $160. Thats not bad in my opinion for an office visit and medicine. Thankfully our cat should be fine. This is a reminder that pet expenses can get high. You never know when a pet may get sick or injured and vet bills can be significant. When my previous cat got sick the vet bill was a few hundred dollars. I have friends and relatives who have had vet bills for over $2,000 level. Previously I looked into getting pet insurance but I didn't find a policy that seemed like a good deal. My preference for paying for vet bills is to have a designated pet emergency fund. By this I mean that you should set aside some funds in a savings account labeled pet emergency fund. You can put $100 or so into the fund automatically every year to keep it funded. I don't officially have such a fund setup myself but have a large standard emergency fund so we could dip into that if we need to pay a large vet bill. Recently we had to replace a furnace in a rental. We paid about $2000 for the furnace and we didn't shop around for an efficient unit. Unfortunately rentals do not qualify for government energy savings tax credits or I'd have an extra incentive to get an efficient unit. Plus we were in a bit of a rush to get the heat back on considering its the winter. We really should have shopped around a bit more but $2000 seemed like a pretty reasonable price and honestly we rushed it. If it were my own home I'd have very likely gone for the high efficiency model. In your primary home you can get a 30% tax credit from the federal government for a higher efficiency furnace so it can make getting the high efficiency unit a no brainer. Its a little hard to find pricing data on furnaces but I found a website that has some prices. Keep in mind this is just one example of prices and what you'll pay locally will likely differ. This is a discount website so their prices are lower than most I'm sure. So don't read much into the numbers please they are just for example sake. An 80% efficient 90k btu furnace is $833. To get a 95% efficient 90k btu unit you have to pay $1069. That is a $236 difference. You can get a 30% tax credit for the higher efficiency unit, so the government will pay $320 of that cost. With the tax credit the more efficient unit is actually cheaper. So the basic cost of the furnace itself is cheaper with the higher efficiency unit. Thats a no brainer to me. With the tax credit your out of pocket cost is lower for the better furnace so its the better option for sure. Costhelper says this about furnace costs: "Replacing an older gas furnace in a central heating system with a mid-efficiency (73-83 percent) unit when there's existing useable ductwork starts around $1,700 -$4,000, but depending on complexity and location can run $5,000 -$7,500 or more" and "A replacement high-efficiency (90-97 percent) gas furnace when there's useable existing ductwork starts around $2,500 -$6,000 but depending on complexity and location can be $7,000 -$10,000 or more." The $1700 to $4000 range for mid efficiency and the $2500 to $6000 range for high efficiency is pretty broad range. But you're looking at a $800 to $2000 difference in the costs. Say you had a quote for $4000 for an 80% and a quote of $6000 for a 95% then thats a $2000 difference for the high end furnace. But with the tax credit you get 30% of the $6000 for $1500 (max credit). That makes the difference only $500. Plus you have to remember the higher efficiency unit will save you heating costs as well. The 95% unit will save around 15% more than the 80% unit. So if your bill with the 80% unit would have been $1180 your 95% unit would be only $1000. Thats a $180 savings per year. The energy savings are big. 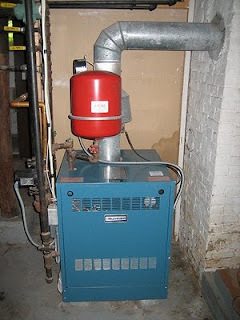 High efficiency gas furnaces are a great buy compared to mid or low efficiency units. Next time you're shopping for a new furnace make sure to look into a furnace with an efficciency rating >95% and take advantage of the government tax credits.